2002-10-07 Assigned to PERIPHERAL PRODUCTS, INC. reassignment PERIPHERAL PRODUCTS, INC. ASSIGNMENT OF ASSIGNORS INTEREST (SEE DOCUMENT FOR DETAILS). Assignors: LOMBARDO, BRIAN, OTTO, JEFFREY P.
2003-05-28 Assigned to PRAXAIR S.T. TECHNOLOGY, INC. reassignment PRAXAIR S.T. TECHNOLOGY, INC. ASSIGNMENT OF ASSIGNORS INTEREST (SEE DOCUMENT FOR DETAILS). Assignors: PRAXAIR CMP PRODUCTS INC.
2003-06-16 Assigned to PRAXAIR S. T. TECHNOLOGY, INC. reassignment PRAXAIR S. T. TECHNOLOGY, INC. ASSIGNMENT OF ASSIGNORS INTEREST (SEE DOCUMENT FOR DETAILS). Assignors: PRAXAIR CMP PRODUCTS, INC.
2003-06-16 Assigned to PRAXAIR CMP PRODUCTS INC. reassignment PRAXAIR CMP PRODUCTS INC. CHANGE OF NAME (SEE DOCUMENT FOR DETAILS). Assignors: PERIPHERAL PRODUCTS, INC.
2014-07-18 Assigned to ROHM AND HAAS ELECTRONIC MATERIALS CMP HOLDINGS, INC. reassignment ROHM AND HAAS ELECTRONIC MATERIALS CMP HOLDINGS, INC. ASSIGNMENT OF ASSIGNORS INTEREST (SEE DOCUMENT FOR DETAILS). Assignors: PRAXAIR S. T. TECHNOLOGY, INC. Foam for making pads and belts with controlled, reproducible microcellular structure and method of making such foam in a fast and efficient manner. Under constant pressure and temperature, a prepolymer is mixed with the nucleation surfactant in a tank in the presence of a frothing agent metered into the tank by way of a dip tube or sparge. The nitrogen gas is sheared into small bubbles and is drawn off from the headspace of the tank creating a continuous flow of nitrogen. The pressure of the tank may vary from any absolute pressure down to near complete vacuum, thereby all but eliminating the pressure requirement. The froth of the present invention has a more consistent cell structure and increased cell count. This application is a continuation-in-part of a co-pending U.S. patent application No. 09/317,973, entitled “Foam Semiconductor Polishing Belts and Pads,” filed May 25, 1999, which is a nonprovisional application claiming priority to U.S. Provisional Application No. 60/087,740, filed Jun. 2, 1998. Foam density, a measurement of the mass of froth per unit volume, is one of the most important properties of froth, directly affecting the durability and support of the foam. It is commonly measured and expressed in pounds per cubic foot (pcf) or kilograms per cubic meter (kg/m 3), but may also be stated as g/cc. Foam density is directly related to the specific gravity of the foam. It should be noted at this point that the term “pad,” as used herein, refers to polishing disks, polishing belts and any other geometric shape that may serve to polish semiconductor wafers. As a result, the term “pad” may be used interchangeably with the term “belt.” Moreover, the term “polishing disk” refers generally to any polishing pad that is used on a rotating, moving or stationary platen, regardless of the pad's shape. In other words, even though most polishing pads used on rotating platens are in fact disk-shaped, the term “polishing disk,” as used herein, is not confined to that shape. The tank  1, which is described in greater detail below in reference to FIG. 2, is typically a cylindrically-shaped vessel with at least one shaft 2, extending from the upper portion of the tank, to which one or more impellers 3 are attached. The prepolymer is mixed with the nucleation surfactant by the rotation of the impeller 3 in the presence of a frothing agent which is metered into the tank by way of a dip tube or sparge 4 located below the impeller, although alternative embodiments may place the sparge at various locations within the tank. In the preferred embodiment, nitrogen is the preferred frothing agent, although it is understood that those skilled in the art may choose to use other frothing agents which produce a froth consistent with the present invention. The nitrogen gas, metered in from below the impeller, flows upward, where it is sheared into small bubbles. At steady state, an equal amount of nitrogen breaks the surface and is drawn off from the headspace of the tank. This continuous flow of nitrogen through the tank removes volatile components and other gas impurities that are often present in the froth produced by conventional frothing methods. These contaminants have an adverse impact on the consistency and planarization performance of the belts produced from such froth. Consequently, by removing these contaminants, the present invention results in polishing pads with improved ability to planarize and a more uniform cell structure which are necessary characteristics of semiconductor polishing pads. FIG. 2 depicts a cylindrically shaped tank  1 with a curved base to assist in the mixing of the tank contents. Tank 1, containing prepolymer resin and a nucleation surfactant 7, receives nitrogen from a nitrogen source 6 through dip tube 4. A flowmeter 5 measures the rate of nitrogen flow and control valve 14 may be used to automatically or manually adjust the flow rate of the nitrogen entering the tank 1, which is usually set between 1-10 standard cubic feet per hour (scfh) depending on the size of the tank. Preferably, the flow rate is 5 scfh. One type of flowmeter commonly used to measure the rate of flow of the incoming nitrogen is a rotometer. The rotometer comprises a vertical tapered tube that houses a movable float that moves up and down in the tube in proportion to the rate of flow. Rotometer 5 has a direct-reading scale that is calibrated to read scfh units. As nitrogen gas enters from dip tube  4 located below the impeller 3 at the lower portion 13 of the tank 1, an electric motor 8 rotates the shaft 2 and the impeller 3. The motor 8 can be set to rotate the shaft 2 and impeller 3 at any speed. Preferably, the impeller rotates at a speed of 400-1100 rpms. More preferably, the impeller rotates at a speed of 803 rpms. The impeller of the preferred embodiment consists of a horizontal disk 10 with vertical blades 11 attached to the perimeter of the disc. The use of high sheer impellers for gas dispersion applications is well known in the art. These impellers are typically constructed of metal or plastic. FIG. 3 depicts one common impeller design often referred to as a Rushton impeller, although any other impeller that creates trailing vortices that perform the function of shearing bubbles may be used. Rushton impellers are radial flow, disk turbines, the diameter of which is typically ⅓ of the tank diameter, and which usually have 4-6 vertical flat blades fixedly attached around the periphery of the disc. The Rushton impeller is designed to provide high shear conditions required for breaking the bubbles of the polymer resin and is often chosen for its ability to deliver high turbulence power numbers. The impeller depicted in FIG. 3 is of the 4-blade design type  20 and has an overall diameter of 6 inches. Although FIG. 3 shows a 6″, 4-blade Rushton design, it is appreciated by those skilled in the art that other suitable impellers having different shapes and sizes, different blade curvatures, different diameters, varying shaft sizes and different number of blades may be used to practice the claimed method depending on variables such as the gas flow rate and power output of the electrical motor. Referring back to FIG. 2, as shaft  2 turns, the fluid 7 inside the tank hits the broad face of the blade and creates a vortex behind it (not shown). This trailing vortex contributes to the creation of the froth by cleaving large bubbles into smaller ones. It is the use of the impeller 3 in conjunction with the continuous nitrogen flow coming from below the impeller that contributes to the froth being produced in a shorter period of time and in a more repeatable and efficient manner than traditional frothing methods. As illustrated in FIG. 2, the nitrogen is metered into the tank from below the impeller and travels upward towards the headspace of the tank where it is drawn out of the tank through pressure regulator  16, which is responsible for accurately controlling the pressure of the tank in conjunction with vacuum pump 15. The nitrogen metered into the tank 1 from the lower portion 13, in combination with pressure regulator 16 drawing off the nitrogen from the headspace above, allows the tank to reach a steady state of nitrogen flow. This allows a froth to be formed without having to create a vortex that draws gas down to the impeller from the headspace of the tank. As a result of this efficiency, the frothing method of the this embodiment is essentially independent of the tank level and results in a more consistent froth, which is a significant improvement over conventional frothing methods. The present method also allows for very accurate pressure control and is able to compensate for small gas leaks that caused conventional closed tanks to lose pressure. 1. A method of producing a stable resin froth used to produce a microcellular pad or belt comprising the steps of placing a thermosetable liquid polymer or prepolymer resin and nucleation surfactant in at least one tank, metering a frothing agent into said tank by way of at least one tube or sparge, drawing off said frothing agent from the headspace of said tank so as to reach a steady state of continuous flow of the frothing agent from said tube or sparge to said headspace of said tank, and agitating said thermosetable liquid polymer or prepolymer resin, nucleation surfactant and frothing agent through the use of an impeller at a controlled temperature and pressure. 2. The method of claim 1, wherein said prepolymer resin is a polyurethane. 3. The method of claim 1, wherein the nucleation surfactant is a block copolymer containing at least one block comprising polydimethylsiloxane, and at least one other block comprising polyether, polyester, polyamide, or polycarbonate segments. 4. The method of claim 1, wherein the nucleation surfactant is a block copolymer containing at least one block comprising siloxane polyalkyleneoxide, and at least one other block comprising polyether, polyester, polyamide, or polycarbonate segments. 5. The method of claim 1, wherein the frothing agent is dry nitrogen or dry air. 6. The method of claim 1, wherein said thermosetable liquid polymer or prepolymer resin and nucleation surfactant are agitated using a radial flow, disc-shaped impeller comprising at least 2 vertical flat blades fixedly attached to the perimeter of said impeller. 7. The method of claim 1, wherein said thermosetable liquid polymer or prepolymer resin and nucleation surfactant form a vortex upon striking said impeller. 8. The method of claim 7, wherein said vortex shears large air bubbles formed by said agitation into smaller sized air bubbles. 9. The method of claim 1, wherein the resin froth is produced under pressure. 10. The method of claim 1, wherein the resin froth is produced under vacuum. 11. 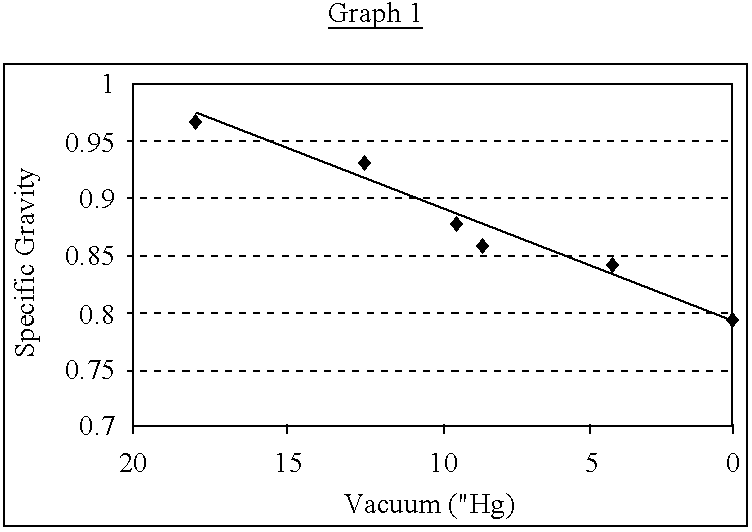 The method of claim 10, wherein said vacuum has a range of 4″ Hg to 16″ Hg. 12. The method of claim 1, wherein a pressure regulator draws off said frothing agent from the headspace of said tank so as to reach a steady state of frothing agent flow. 13. The method of claim 1, wherein said frothing agent is metered in at a rate of 1-10 scfh. 14. The method of claim 1, wherein said continuous flow of the frothing agent removes volatile and other gas impurities contained within the froth. 15. The method of claim of claim 1, wherein said frothing agent is metered in through dip tubes located at a level below said impeller. 16. The method of claim 1, wherein said frothing agent is metered in through dip tubes located parallel to a level below said impeller. 17. The method of claim 1, wherein said impeller is capable of rotating at various speeds. 18. The method of claim 17, wherein said impeller has a 6″ blade. 19. The method of claim 18, wherein said impeller rotates at a speed ranging from 400 rpms to 1100 rpms. 20. The method of claim 1, wherein said impeller is coupled to a shaft, said shaft controlled by a power package which controls the speed at which the shaft and impeller rotate. 22. The method of claim 1, wherein the specific gravity of said froth will be in the range of 0.8-0.95 g/cc. 23. The method of claim 1, wherein the froth is produced in less than 4 hours. 24. The method of claim 1, wherein the density of said froth and average microcellular cell size can be varied independently of each other. 25. A method of producing a high density, microcellular pad or belt comprising the steps of placing a thermosetable liquid polymer or prepolymer resin and nucleation surfactant in at least one tank, agitating said thermosetable liquid polymer or prepolymer resin and nucleation surfactant throught the use of at least one impeller, metering a frothing agent into said tank by way of a tube or sparge located below said impeller, drawing off said frothing agent from the headspace of said tank so as to reach a steady state of continuous flow of the frothing agent from below said impeller to said headspace of said tank, metering the resin froth under pressure to a mix head, combining the resin froth with a curative, and injecting or pouring the resin froth into a mold; said pad or belt being free of hollow microelements or microballoons. 26. The method of claim 25, wherein a catalyst is added to said curative or said froth prior to entering said mold. 27. The method of claim 25, wherein a blowing agent is added to said curative or said froth prior to entering said mold. 28. The method of claim 25, wherein said froth is metered into a mixhead at a pressure ranging from atmospheric to 200 psi. 29. A method for making high density foam with controlled, reproducible microcellular structure by mechanical frothing, comprising agitating a liquid polymer resin in the presence of a frothing agent and nucleation surfactant at a controlled temperature and any absolute pressure in order to produce a stable froth, metering the resin froth under pressure to a mixhead, optionally combining the resin froth with a curative for the resin, and injecting or pouring the resin froth into a mold. 30. The method of claim 29 wherein the resin is a thermoset polymer. 31. The method of claim 29 wherein the resin is a polyurethane. 32. The method of claim 29 wherein the nucleation surfactant is a block copolymer containing at least one block comprising polydimethylsiloxane, and at least one other block comprising polyether, polyester, polyamide, or polycarbonate segment. 33. The method of claim 29 wherein the nucleation surfactant is a block copolymer containing at least one block comprising siloxane polyalkyleneoxide, and at least one other block comprising polyether, polyester, polyamide, or polycarbonate segment. 34. A froth for producing microcellular pads and belts with consistent cell structures or properties, comprising a polymer or thermosettable polymer, a nucleation surfactant, and a frothing agent, wherein said froth is free of hollow polymeric microelements or micro ballons. 35. The froth of claim 34 wherein said nucleation surfactant is a block copolymer containing at least one block comprising polydimethylsiloxane or siloxane polyalkyleneoxide, and at least one other block comprising polyether, polyester, polyamide, or polycarbonate. 36. The froth of claim 34, wherein said polymer resin is a polyurethane. 37. The froth of claim 34, wherein said froth has a specific gravity within the range of 0.7-1.0 g/cc. 38. The froth of claim 34, wherein said froth has a specific gravity within the range of 0.8-0.95 g/cc. 39. A high density microcellular pad or belt with consistent cell structures, comprising a polymer or thermosettable polymer, a nucleation surfactant, and a frothing agent, wherein said froth is free of hollow polymeric microelements or microballoons. 40. The pad or belt of claim 39 wherein said nucleation surfactant is a block copolymer containing at least one block comprising polydimethylsiloxane or siloxane polyalkyleneoxide, and at least one other block comprising polyether, polyester, polyamide, or polycarbonate. 41. The pad or belt of claim 39, wherein said polymer resin is a polyurethane. 42. The pad or belt of claim 39, wherein said pad or belt has a specific gravity within the range of 0.5-1.2 g/cc. 43. The pad or belt of claim 3, wherein said pad or belt has a specific gravity within the range of 0.7-1.0 g/cc. 44. The pad or belt of claim 39, wherein said pad or belt has a specific gravity within the range of 0.85-0.95 g/cc. 45. The pad or belt of claim 39, wherein said pad or belt has open-celled structures.